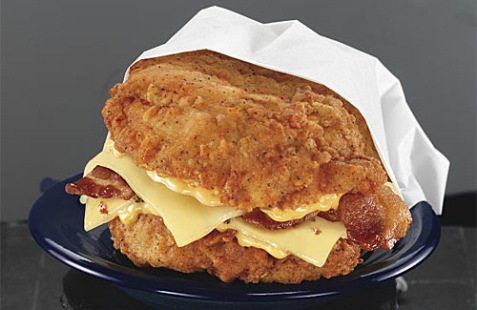 The new “Double Down” sandwich from KFC is getting quite a bit of buzz, so we had to try it out. You’re certainly not thinking about your waistline when eating it, so it better deliver on taste! In that area we were very impressed – it’s juicy, greasy and delicious! We’re guessing it will become a late-night favorite for the beer-drinking crowd (which includes most Bullz-Eye readers). The “sandwich” boasts 540 calories, 32 grams of fat and 1,380 milligrams of sodium! It’s really not much of a sandwich as it doesn’t have any bread. Instead you have 2 slabs of fried (or grilled) chicken with bacon, cheese and more in between. Fortune calls it the “Colonel Punishment” while acknowledging it has created a media sensation. Jimmy Fallon recently featured it on his show. It’s only available for a limited time, but we’re guessing this one will become a regular item. We can’t remember the last time a so called sandwich had so many people either offended or excited to dig in or stay away! Domino’s Pizza has a new recipe . . . and we like it!